Civil trial rates are at an all-time low. Meanwhile, “trial time limits” — judicially imposed limits on the time litigants have to present their evidence at trial — seem to be at an all-time high. We have fewer trials than ever, yet we’re taking aggressive steps to curtail the few that we’ve got. This Article zeroes in on this paradox. It excavates time limits’ origins, tracks their rise, examines their administration, and raises deep questions about their fairness and utility. Trial time limits have, so far, been variously ignored or, alternatively, lauded, as a way to promote juror comprehension and as a tool to make trials cheaper and more efficient. Indeed, one court has gone so far as to call these restrictions “essential” to sensible docket management. This Article challenges that conventional story and cautions against time limits’ regular or reflexive application. In so doing, this Article seeks to begin a broader inquiry into how the American civil trial of the twenty-first century is not only disappearing; the scattered trials that remain are also changing, in subtle and hard-to-quantify but profoundly important ways. Most folks who serve as jurors dread it going in but are happy that they served. Read what author and professor Paula Carter had to say about her experience in Chicago. The local NPR station in New Orleans provides a brief historical overview of Louisiana's split verdict jury system. Only Louisiana and Oregon allow defendants to be convicted with 10-2 verdicts. Louisianans will have the opportunity in November to vote on whether to keep the old system or follow the 48 other states and require unanimous verdicts for all criminal trials. To listen to the story go here. On September 13, 2018, the Council of the City of Philadelphia passed Resolution 180755. The resolution authorizes the Committee on Law and Government to hold public hearings to examine the benefits of providing childcare in courtrooms for jurors and others involved in court business, and to evaluate the feasibility of instituting such a childcare system in Philadelphia. This is a very interesting document and is worth taking the time to read. The Council recognized that there is a linkage between providing childcare and ensuring that juries are a fair cross section of the community. They cited to a 2016 report entitled Best Practices for Jury Selection and Service in Pennsylvania by the Pennsylvania Interbranch Commission for Gender, Racial and Ethnic Fairness and to a 2018 report by theJuror Participation Initiative Committee. From a national perspective, this resolution demonstrates that the hard and often tedious work of jury committees can lead to real improvements within their jury systems. If your court implemented a child care program for jurors and you have noticed a change in the demographics of your jury panels, please send an email to Greg Hurley at ghurley@ncsc.org describing your observations. 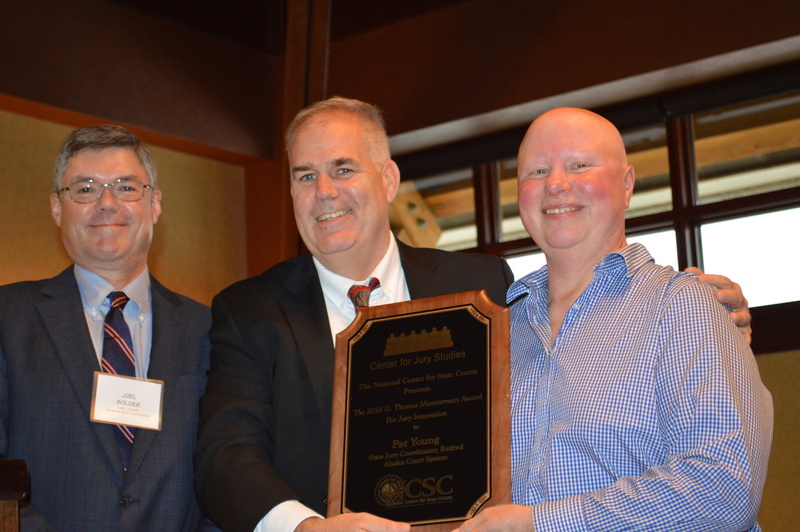 Williamsburg, Va., Oct. 10, 2018 – Pat Young, the statewide jury coordinator for Alaska from 2007 to 2016, is the recipient of the National Center for State Courts’ (NCSC) 2018 G. Thomas Munsterman Award for Jury Innovation. The Munsterman Award recognizes states, local courts, individuals and organizations that have made significant improvements or innovations in jury procedures, operations and practices. 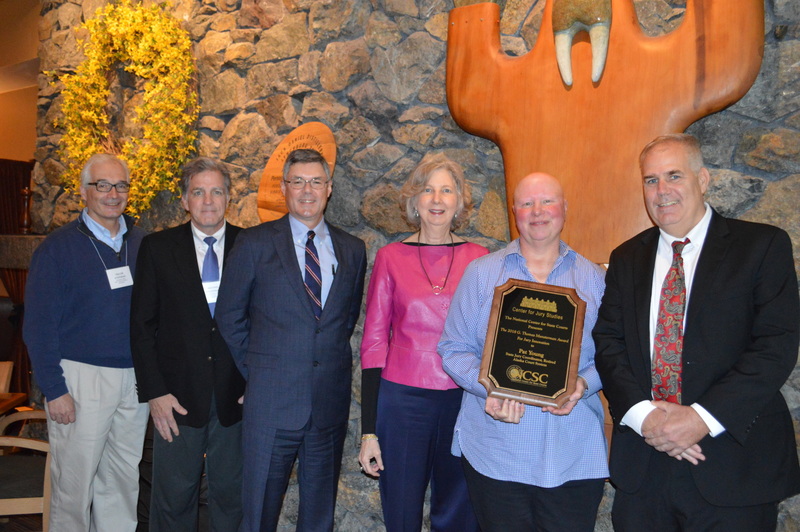 Ms. Young, who received the award today at a judicial conference in Girdwood, Alaska, demonstrated exceptional leadership and project management skills in bringing together many different parts of the court system to propose and implement several significant jury management innovations. She led a team to spearhead the transition to a postcard notification, prompting jurors to complete an online questionnaire. That innovation saves the state about $70,000 a year. She also was a key player in encouraging the court system to undertake the development of updated jury videos, and she was instrumental in coordinating the development of a juror services web page. What’s more, she developed judicial training on juror utilization, which was new to Alaska and has led to improved juror utilization numbers, greater efficiency for jury clerks and a more respectful juror experience. "And just in case you all were wondering what I was talking to the juror about, found out he buried his wife on Saturday. His wife passed away. And I said, well, you certainly would not have had to have served. He said, no. But I said, well, that’s above and beyond the call of civic duty, that’s for sure." On appeal, the defendant claims that the trial judge should have granted a mistrial because the juror failed to answer the hardship question during voir dire honestly. The Missouri Court of Appeals disagreed. The jurors were asked if they had “anything going on in their life that would distract them from being a fair and impartial juror in this case?” The juror at issue obviously had something significant going on in his life but there is no indication that it would have affected his ability to be fair and impartial. Today, nineteen million American citizens bear the mark of a felony conviction, far more than in any prior era. With that mark comes a host of record-based restrictions that curtail access to various political, social, and civic institutions. One such restriction impacts convicted felons’ eligibility for jury service. Forty-nine states, the federal government, and the District of Colombia statutorily limit convicted felons’ opportunities to serve as jurors. Justifying these restrictions, lawmakers and courts suggest that convicted felons, if allowed to serve, would diminish the quality of the deliberation process. This exploratory mock jury experiment is the first to assess jury deliberations that include felon-jurors, comparing 1) homogeneous juries comprised entirely of non-felon-jurors to diverse juries comprised of both non-felon and felon-jurors and 2) non-felon-jurors to felon-jurors. Results suggest that on theoretically derived measures of deliberation structure, deliberation content, and juror perceptions, diverse juries performed as well as homogeneous juries. Data also tend to demonstrate few statistically significant differences between felon-jurors and non-felon-jurors. Notably, on measures of novel case facts covered and time spoken as a proportion of deliberation duration, felon-jurors outperformed their non-felon counterparts, perhaps calling into question the purported threat they pose and the necessity of blanket felon-juror exclusion policies. Here is a brief video discussing the role of race in the jury. On November 6, 2018, voters in Louisiana will have the opportunity to change the Louisiana Constitution and require unanimous verdicts in non-capital criminal cases. Proposed Amendment No. 2 will ask “Do you support an amendment to require a unanimous jury verdict in all non-capital felony cases for offenses that are committed on or after January 1, 2019?” The proposal would amend Article I, Section 17(A) of the Louisiana Constitution. The San Diego Union-Tribune reported on October 8, 2018 that the Office of the San Diego Auditor is critical of the way the city has handled jury service for city employees. They issued a report that indicated that over a 5 year window from 2012 to 2017 the relaxed city policies cost the city $61,000. City workers are paid their regular salary while the perform jury service. The report indicated that city workers were not requesting automatic statutory exemptions which some could have because they performed jury service in the prior 3 years. The report also indicated that some employees may have been falsely claiming they performed jury service and their supervisors failed to verify their claims. Another Form of Juror Discrimination? The Court of Appeals of Kansas issued an opinion in State v. Peterson on October 5, 2018. Mr. Peterson was convicted of sexual offenses involving a minor. He is likely African-American although the appeals court noted that wasn’t completely clear from the record. (In fact, the appeals court was very critical of the record for not being as complete as they would have liked.) However, the prosecution used peremptory challenges to remove 5 of the 7 African-American jurors. The defense objected, claiming that there was a discriminatory motive in the prosecution’s use of their peremptories. The trial court effectively determined that removing 5 of the 7 African-American jurors was an insufficient prima facia case to require the prosecutor to give race neutral explanations for each removal. The Court of Appeals of Kansas held that removing 5 of the 7 African-American jurors is enough evidence for a prima facia case and the trial judge should have required the prosecution to make race neutral explanations as to why they were removing each juror. Therefore, they reversed and remanded the case. However, the appeals court noted something in dicta that is even more interesting. The trial court in Mr. Peterson's case used a numerical system to determine which juror would be the alternate. Every juror had a number and the lowest 12 numbers would be the trial jurors. The juror with the highest numbers would be the alternate. One of the African-American jurors had a high number and she ultimately was the alternate. The appeals court noted that the attorneys trying the case where clearly aware of the numerical system and the numbers of the actual jurors in the case. Therefore, the prosecution may have further manipulated the system by exercising their peremptories against only jurors with higher numbers than the African-American juror that ended up as the alternate. By doing so, they could have ensured that she would be the alternate thereby unlawfully partially removing her from the case. This is a really interesting and astute observation. It may be a reason for other courts to randomly select the alternate(s) after the entire jury is selected. CNN reported on October 7, 2018, that after serial killer Andrew Urdiales was sentenced to death in a California courtroom, he praised the jury. He also said that he did not have any negative feelings towards them and he would have decided his case the same way had he been a juror. The story does not speculate as to whether Mr. Urdailes is crazy, gaming the system or was being honest. Counterintuitively, the Pope’s recent announcement that the death penalty is impermissible in all circumstances may make death sentences easier to come by, at least in the short term. The reason for this peculiarity is the “death qualification” of capital jurors – the process of questioning prospective jurors about their views on the death penalty and removing for cause those who are “substantially impaired” in their willingness to consider imposing a death verdict. This Essay anticipates three problematic consequences of the Pope’s declaration, given a capital punishment system that relies on death-qualified juries. First, prosecutors will likely be able to strike a greater number of death-averse jurors, thereby seating juries tilted in favor of death and obtaining death verdicts with greater ease. Second, with more believing Catholics excluded from jury service, the representativeness – and hence the legitimacy – of capital juries will suffer. Third, if the number of death verdicts rises with the ease of disqualification, one of the key “objective indicators” of “evolving standards of decency” will be skewed, registering more support for the death penalty despite – indeed, because of – societal movement against it. The potential for these unexpected consequences to flow from a major pronouncement against the death penalty highlights how death qualification shapes and distorts the practice of capital punishment in our country. The largest newspaper in Louisiana is the latest entity to come out in favor of juror unanimity, which will be on the ballot next month when state residents vote on a constitutional amendment that prohibits the current practice of allowing 10-2 verdicts in criminal trials. According to the Times Picayune, "Constitutional Amendment 2 on the ballot Nov. 6 would require unanimous juries for serious felony offenses -- those where the punishment is imprisonment at hard labor. State law already requires unanimous juries in capital cases and for six-member juries in lesser felonies. If the amendment passes, it would apply to cases on or after Jan. 1, 2019." While Louisiana had originally required unanimous criminal juries, its constitution was modified post-Reconstruction in 1898. To read the Op-Ed go here. The ABA has a monthly cartoon caption contest. This month’s cartoon features clowns responding to jury summonses. It is a humorous cartoon, and you might be able to be the big winner and have your caption featured in an upcoming edition of the ABA Journal. Follow the link to enter and all entries must be submitted by October 14th. In Your Area reported on September 28, 2018 that a thief stole a juror’s bike near the Reading Crown Court in the United Kingdom. The juror had been riding to court each day for jury service. The juror said he was surprised at the theft because the bike is older and not mechanically sound. He further stated, "The back brakes don't work, so who knows, maybe he'll crash into something?" A bystander saw the theft taking place and was able to snap a picture. So, it is possible the thief will soon be back at the courthouse for his own case. The Supreme Court of the State of New York, Appellate Division, Fourth Judicial Department rendered an opinion in People v. Farley on September 28, 2018. Mr. Farley was tried by a jury and found to be guilty of assault in the first degree. During jury selection, a juror indicated she knew a potential witness, a trauma surgeon who treated the victim for knife wounds inflicted by defendant. The juror stated the surgeon had treated her two years prior to the trial, visited her daily over a 14-day treatment window and saved her life. When asked if she could be fair and impartial to Mr. Farley she repeatedly asserted “that she would not let her personal feelings about the surgeon interfere with her ability to assess the evidence objectively and that she would afford both sides a fair trial.” The defendant moved to remove the juror for cause which was denied. Then, the defendant used his last peremptory challenge to remove the juror in question. On appeal he alleged that the trial court erred in denying his challenge for cause and that said denial amounted to reversible error. The intermediate appellate court agreed with the defendant. They found that the relationship between the juror and the surgeon created an “implied bias” that required “automatic exclusion from jury service regardless of whether the prospective juror declares that the relationship will not affect her ability to be fair and impartial.” They stated that the factors courts should consider when determining if a juror has an implied bias “include the nature of the relationship and the frequency of contact.” In this case although the relationship between the surgeon and the juror was essentially professional, from the juror’s perspective it was something more as she held a deep belief that the surgeon had saved her life. The case was reversed and remanded. The Commonwealth of Massachusetts Court of Appeals issued an opinion inCommonwealth v. Maldonado on October 1, 2018. Mr. Maldonado was convicted of leaving the scene of an accident and various other traffic offenses following a jury trial. Juror #26 was a Massachusetts State police officer who had previously worked with the District Attorney’s Office in the same jurisdiction where Mr. Maldonado was being tried. Juror #26 was also “unequivocal in responding to the trial judge that he could be fair and impartial regarding the case.” The defendant moved to remove the juror for cause and the trial judge denied on the motion. On appeal, the defendant claimed he was denied his right to an impartial jury because the judge abused his discretion in failing to excuse for cause. The Commonwealth of Massachusetts Court of Appeals disagreed with the defendant and affirmed the convictions. They quoted Commonwealth v. Ascolillo, 405 Mass. 456, 461 (1989), quoting Commonwealth v. Amazeen, 375 Mass. 73, 83 (1978) and stated. “…the judge who had the opportunity to observe the prospective juror, make a determination that the juror is indifferent after exploring the grounds for a possible claim that the juror was not impartial, we cannot conclude, in the absence of any affirmative evidence to the contrary, that the judge abused his discretion." Effectively, this appellate court declined to do the kind of implied bias analysis that The Supreme Court of the State of New York, Appellate Division, Fourth Judicial Department did in the previous case. The Georgia Court of Appeals issued an opinion on October 1, 2018 in Coffee v. State. Following a jury trial, Mr. Coffee was convicted of four counts of theft by shoplifting at a Walmart. During voir dire, Juror #39 indicated that he owned stock in Walmart but likely indicated he could be fair and impartial to the defendant (that hearing was noyt on the record for unknown reasons). Mr. Coffee made the appropriate motion to remove the juror for cause which was denied. He then utilized a peremptory challenge to remove the juror. The Georgia Court of Appeals held that the trial court committed err by refusing to remove the juror for cause. They stated, “In general, a defendant is entitled to a panel of 30 qualified jurors (that is, jurors not subject to being excused for cause) to which to direct his peremptory strikes.” Therefore, they determined that they was reversible error and reversed the convictions. Attorney Robin McKechney published an opinion piece in Policy Options Politiques on October 1, 2018. He noted that following the acquittal of Gerald Stanley who was accused of the murder of a Cree man, the Canadian jury system received substantial criticism of the racial fairness of the compositions of its juries and the fairness of the verdicts they deliver. He discusses various proposals that have been suggested to remedy the problem which include eliminating all peremptory challenges, allowing challenges that appear to be racially motivated to be reviewed by the court (essentially adopting the test developed in Batson v. Kentucky), using three-judge panels instead of juries and eliminating the post-verdict juror secrecy that now exists. This is an interesting article worth reading.